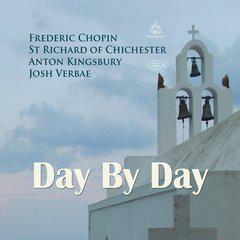 Day By Day includes reading of the eponymous prayer followed by beautiful piano music based on original composition of Frederic Chopin. Piano composition includes: Nocturne in F Minor, Op. 55 No. 1 — Andante. Chopin's bittersweet nocturnal piece with dramatic and anxious progression culminating in an exciting stretto. Chopin dedicated this nocturne to Jane Stirling, a devoted pupil. Performed by Anton Kingsbury.